An NHS trust has said it will look into why there have been more patient deaths than expected at three hospitals. 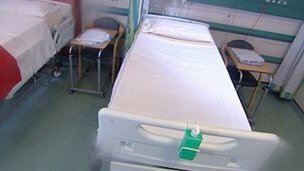 Worcestershire Acute Hospitals Trust is one of 36 trusts where the mortality rate rose in the past year, according to a new indicator used. The trust includes the Alexandra Hospital in Redditch, Kidderminster Hospital and Treatment Centre, and Worcestershire Royal Hospital. The trust added that it would “investigate any underlying problems”. The England-wide Summary Hospital-level Mortality Indicator (SHMI) looks at deaths in hospitals and up to 30 days after a patient is released. Figures showed 2,681 deaths were recorded in the year ending March 2011, but only 2,442 had been estimated. The indicator’s aim is to assess whether the mortality rate is within or outside the expected range after taking into account risk factors for the type of patients a trust treats. Dr Charles Ashton, medical director at Worcestershire Acute Hospitals NHS Trust, said: “We actively monitor our mortality rates and, where these are higher than average, this is used as a trigger to investigate and understand any underlying problems – whether in the quality of care that the hospital is delivering to its patients, care after discharge or in data collection processes. “We are establishing a system for every death to be systematically reviewed by senior doctors and to ensure that they are recorded accurately in our records. Peter Pinfield, chairman of the public and patient involvement committee, and member of the primary care trust board, added: “Like all figures, you have to take them with a pinch of salt, but of course they’re worrying and they’re serious. “We don’t want people to die, so the figures tell a story, but we shouldn’t over react. Hospitals are there to make people better, but unfortunately sometimes people do die.